Hi, everyone! I know I’ve been a little MIA on the blog and Instagram lately and I’m sorry for that. Between the day gig and a little side project I started during the weekends, it’s been quite busy. 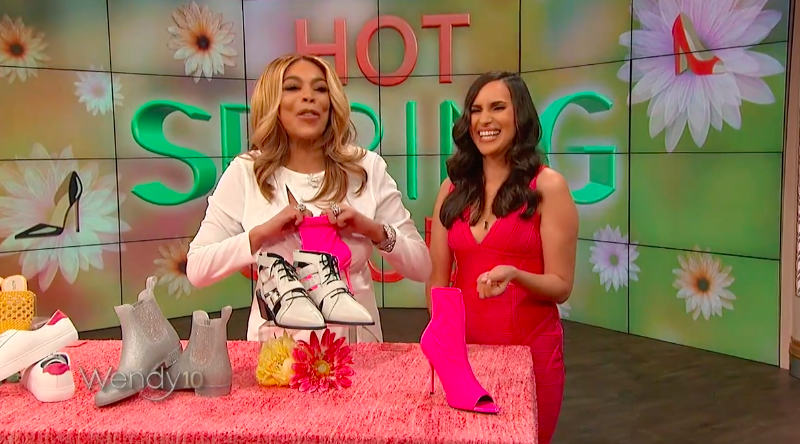 But I’m here with an update: I was invited back to the Wendy Williams Show and this time we talked about spring shoes! I want to thank the show’s glam team Nani and Irving for today’s look! Watch the shoe segment below or click on the photo of Wendy and me up top. What do you think of this dress? I bought it at TopShop in SoHo. It’s from the House of CB. I think it was the first time I purchased anything from there. I knew I wanted a fun color for the segment so I tried on this bandage dress. I usually try to avoid v-necks because I’m pretty flat chested, but somehow this dress gave me a bit of cleavage. Hey, I’ll take it. Thanks for your lovely comments on Facebook and Instagram. I really appreciate it. I’ll try to update the blog more frequently.